Celebrate your summer with Music! 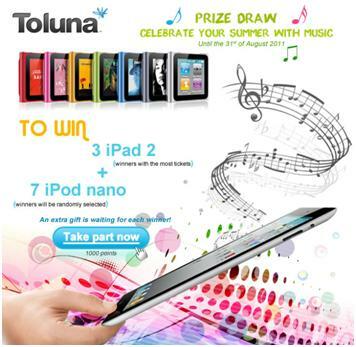 Toluna is pleased to announce the latest opportunity for our members to win fantastic prizes! 7 x iPod Nano’s – 7 Members selected randomly from the prize draw. Each entry is just 1000 points and you can buy as many tickets as you want! Finally, to make the summer even more special each winner will also receive an extra gift as a surprise! Redeem your points now for the chance to win one of these fantastic prizes. In case you missed them, don’t forget to check out the success of some of previous prize draw winners here.